WOW! 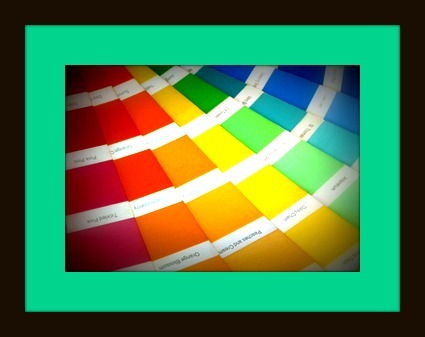 Women On Writing Blog: What Color is Your Writing World? Earlier this week, while I proofread a few chapters from my current WIP, a scary thought raced through my mind. Now, I'm not saying the writing is bad, it's just lacking color in these chapters. Kind of disappointing coming from a writer with "Mango Crush" on her office walls. But the revelation reminded me of an exercise I would use with freshman English students who struggled to bring color to their writing. Perhaps I'd asked them to describe the sun, bring it to life through color. What would I get? Yellow. Plain ol' yellow. I would ask them to describe the shade of yellow. Is it the color of butter? Of a buttercup along a country road? The yellow of a middle-of-July sunflower? Post-it note yellow? "Just yellow," students would reply. "Show me what kind of yellow." Once they saw the connection between a concrete example and word choice, their writing improved. I don't want my writing to be 'just yellow' - or just plain ol' white - for that matter. I want vibrant words to run down the pages. After a trip to the lumber yard, Eros Pink, Adriatic Sea, and Jargon Jade complete the scenes, along with a tinge of Crescent Moon White. I've used those paint samples that I've borrowed/snagged/stolen from hardware stores, punched a hole in each of them, and put them on a round key ring, so they're handy for kids to use. Yes, "vanilla" is fine, but we wouldn't want to live on an entire diet of only vanilla ice cream, white bread, and mashed potatoes. We need strawberry and chocolate syrup, we need a layer of melted cheddar cheese, we need a brown gravy speckled with pepper to make it appealing. Great reminder! Like the way you have used paint chips ! Great writing idea--I think it would work for adult writers, too in a writing workshop. Oh my god thank you. I have a giant collection of paint samples to help me with colour and people always think I'm crazy.